Identify network ports instantly LED patch panle is equipped with LED indicator on each port. 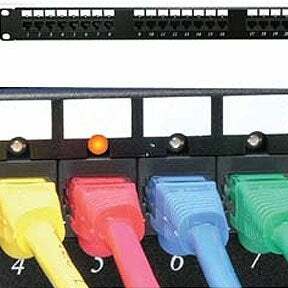 Identify network ports instantly LED patch panel is equipped with LED indicator on each port. At SF Cable, you can find good quality LED patch panels at very competitive prices. You can choose from a variety of products and order them at your convenience. We have 24 Port Cat 5E 110 patch panel rackmount with LED indicator, signal transmitter for patch panel with LED indicator, 48 Port Cat 5E 110 patch panel rackmount with LED indicator, 24 Port Cat 6 110 patch panel rackmount with LED indicator, 48 Port Cat 6 110 patch panel rackmount with LED indicator, and other products to choose from. Customer satisfaction is the first priority at SF Cable. To achieve it, we only deliver products that are manufactured by ISO 9001-2000 registered manufacturers. We also offer good after sales service and lifetime technical support on all our products.